The Body Shop had huge sales over the last month and I took the time to stock up on some necessary shower essentials. The huge discounts made it hard for me to not pick out a few key items that I needed to restock my shower. I am a big fan of their Banana Shampoo and Banana Conditioner as a set. The Banana shampoo is described as a product that “gently cleanses and nourishes your hair leaving it feeling clean, soft and silky.” I think these products live up to the hype they’ve gotten on numerous other beauty blogs. The scent does smell like real bananas, but if that’s not your thing, know that the scent dissipates after you have washed the shampoo and conditioner out of your hair. What doesn’t leave is how nice and soft your hair feels after. This is the shampoo and conditioner set that I find myself constantly going back to because I think this set works that well. Another necessity that I really needed to stock up on was The Body Shop’s body butters. The Body Shop is well known for their large selection of amazingly scented butters and I am not immune to wanting to stock up whenever I see a sale. I decided to splurge and get a HUGE container of their Satsuma Body Butter. The Body Shop jumbo container is a bit more expensive than the usual body butters. I usually stock up on their body butters when they are on sale for $10, but the jumbo container is a steep buy at $25. Besides the big container of the Satsuma Body Butter, I wanted to try out one of their newer scents, the one that claims to smell like chocolate, Deluxe Edition Chocomania. While the scent doesn’t resemble a delicious dessert, it is a good body butter that emits a more nutty, than chocolate scent. It was an interesting butter, but not something I would get again if I was interested in a chocolate scent. Something I was really excited to try was the Vineyard Peach Body Lotion. It is a great everyday body lotion with an amazing scent that even my boyfriend comments and compliments me on! It keeps my legs smoother in between shaves and if you’re looking for a new go-to body lotion, I would totally suggest the Vineyard Peach body lotion. One of the highlights of the sale was the holiday kits from the Body Shop. These little kits contained miniatures of their great products and if you know me, you know how much I love mini things! 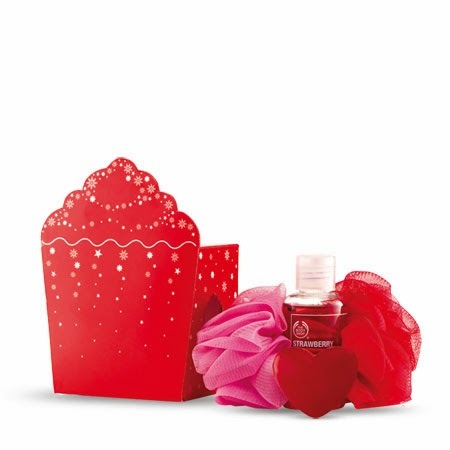 One of the adorable holiday kits I was ecstatic about was their Strawberry Cupcake bath set. The set contains a miniature Strawberry shower gel, an adorable strawberry mini heart soap and two cute red and pink mini loofas. All of these products smell delicious and are perfect for traveling. They definitely make me want to start planning my next trip. I loved being able to use the sale to stock up on my Body Shop favorites and to branch out and try new products to find new loves and Body Shop obsessions!